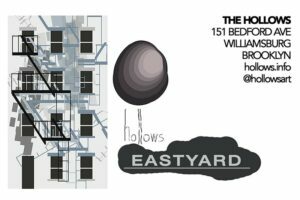 This weekend, The Hollows artspace in Williamsburg will be kicking off their new summer programming series – The Hollows Eastyard – in the garden of their townhouse at 151 Bedford Avenue (between North 8th and North 9th Streets). The Hollows Eastyard will be housing installations by two artists: Inverse and Tear, kinetic disco ball pieces by Kiichiro Adachi; and Shaddows in Faacad, a vertical city mapping mural by Halaburda, for which the artist incorporates the shadows of the back facade fixtures. Additionally, The Hollows Eastyard will include monthly programs focusing on sound in July, screenings in August and talks in September. July Sound at The Hollows Eastyard explores the nuances of performing in electronic and electroacoustic music. Twelve artists and artist groups over the course of four Saturdays will offer their solutions to the modern headache of performing electronically manipulated music. Each day will offer a mixture of approaches spanning multiple genres. Performances will range from analog loop based collages to live synthesis, computer triggering, and spoken word. Performing artists include James K, Cameron Orr, Salt Cathedral, members of Orchid Tapes label, and many more. The Hollows Eastyard will be open to visitors on Saturdays from 2-8pm and to Friends of The Hollows on Fridays and Sundays from 2pm-8pm, with late evening yoga sessions by Teresa Zaga between 8:30-9:30pm on Saturdays in our urban oasis, right before stepping onto a Saturday Bedford Ave.